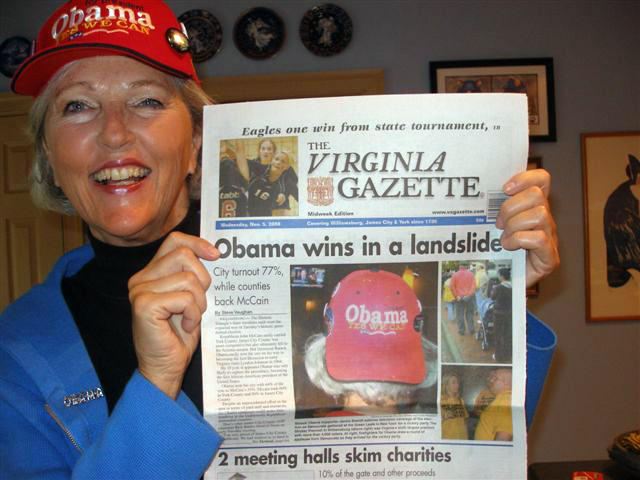 Above: Mutti with a copy of today’s Virginia Gazette, November 5, 2008. First, only her left nostril and forehead were visible, now, it’s enough for the back of her head on the front page. Well, here ist die liebe Mutti, a tireless Obama volunteer in Virginia. Thanks for helping to win it! You betcha! What a pleasure it was – onward. Like he said we must all work to bring about the new world order- at last a leader we can follow! This entry was posted by Erik Brandt on Wednesday, November 5th, 2008 at 7:57 PM	and is filed under Aktuell, Art, Free Radicals, Globalization, International, Minneapolis, News Links, Typografika, Typography.